O what we wouldn't give to see Robbie still able to do that with a rugby ball right now! And to have Tadhg Furlong fit and ready to face Wales. AND to have prevented the Italians posting their highest ever points total at the Aviva Stadium. Yet here at Harpin Manor we seem to have something of a reputation for accentuating the positive, so I don't see any reason for changing when it comes to this match. Much better to focus on the 56 points more than the 19, the eight tries for more than the three against and the quality of our performances more than the quantity of our injuries. Loads of Irish online comments were negative at full time, but I'm wondering how much of that was down to the fact that our second half, and thus the most recent in the memory, was far inferior to the first. Yet even that forty minutes was won 28-19 with a bonus point won even not counting any scores from the first half. But when taken in isolation, I'm not sure we could possibly hope for a better demonstration of the way Joe Schmidt wants test rugby played than minutes one through forty. Fine, maybe the opposition wasn't exactly world beating, but do I really have to dig up the phrase 'you can only play what's in front of you'? I guess I do. The Italians took the opening kickoff and right off the bat we were able to settle into our familiar pattern, getting front foot ball here, creating space for the backline there, before we get all the way to the visitor's 22. Yes, they were soon able to clear, but the resulting lineout being still in their half was very much a contingency of our initial exit strategy. Over the next couple of minutes, some things didn't go to plan - a knockon from Aki running a hard line for example - but when that happened and Italy tried to get going, we were able to seamlessly revert to defensive mode and it wouldn't be long before we were on the attack again. Before long we're winning a penalty, getting back into their 22 and then we're hammering away at their line...Conor Murray gets over and is held up but not to worry, after the following scrum Robbie Henshaw is running a line with more than enough momentum to get him over. Just 11 minutes gone, it's already 7-0 and just four minutes later Sexton is already lining up another conversion after some great link play between Stockdale and Conan puts Murray over in the corner...and not surprisingly our star outhalf made light work of the touchline extras. By the end of the first quarter, we've a third try in the bag after maul gets to the line and Bundee Aki gets his first for Ireland with a similar line to that of Robbie earlier, now it's 21-0 and time for the game's longest spell without a score - eleven whole minutes!!! During that time Conor O'Shea's men tried to make some headway yet found yards after the tackle extremely hard to come by until eventually Dan Leavy burrows the ball out of a ruck before putting Aki through and with Earls in support it becomes an easy finish. It hardly feels like we've broken sweat and we've the try bonus wrapped up already. Whatever the opposition, that was a dream first half. They won't come oftenat test level but when they do it should be applauded. The only drawback in that time of course was the early removal of Furlong but it came as no surprise to Leinster fans in particular that Andrew Porter was ready to step in and put in a decent shift in his place. Is there any chance I can suggest Robbie Henshaw deserved man of the match without anyone thinking I'm only saying that because he's Leinster and the actual winner Conor Murray is Munster? Well I guess I'll just have to take that risk but in my defence I was tweeting the opinion as he was being stretchered off before the award was given. The guy has world-class ability, world-class work rate, world-class knowledge of the game, and he is clearly getting world-class coaching. I sincerely hope nobody has him in their ideal XVs at full-back anymore...he belongs in the centre and is first choice there when fit. However - since he's now unavailable for a while, we need to crack on. If we really think we can reach the final four of a World Cup, we have to be able to handle absences like this. So who do we go for? Here's another Irish starter at the peak of his powers. It would have been more surprising if Earls WASN'T among the tries when we got as many as eight, but his contribution will be most remembered for 'that tackle' at the very end. Is there any chance I can suggest that Mattia Bellini missed a trick in his run that could have resulted in a try without anyone thinking I'm trying to take the shine off of yet another Munster player's achievement? Well I guess I'll just have to take that risk. Actually I think Earls did everything he could do to catch the Italian, picking where he thought his prey would be caught in a straight line, and setting off at full pace hoping the sight of him in the rear view would cause Bellini to panic. For me, that's exactly what happened - a quick step at the 22 could well have gotten around Keith but the overall intimidation factor plus the actual tackle which still had to be made were a delight to watch. 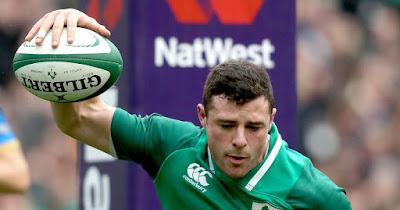 Perhaps Chris Farrell is a more 'like for like' replacement for Robbie in the 13 jumper against Wales but my instincts tell me Earls is the way to go, assuming Ringrose won't be ready of course. He has played there before for Ireland, he has already spent about half an hour there with Aki, he has two whole weeks to prepare, and he's in the form of his life right now. Plus, we have plenty of wingers to take his place. Bundee Aki looked like he belongs in Joe Schmidt centre pairing from the opening minutes against the Springboks, and he seems even more settled as he goes along. I still think 'Henrose' is our ideal pairing but like I say it's all about having alternatives and Aki is a huge part of our plans for the rest of this championship. Jacob Stockdale played like someone who was keen to put Paris behind him, especially the way he took his second try. I was delighted he got another chance to start and now I see no reason why he should relinquish his starting jersey just yet. And towards the end we got a little taste of what Jordan Larmour can bring though I really do believe he needs to playing in a more central position to fully display his talents. And I have one more of these...is there any chance I can suggest that Luke McGrath is a better option to play with Joey Carbery off the bench without making it look like I can't let go of my Leinster bias? I guess I'll have to take that risk. The pair of replacement halfbacks started well when they came on but I just feel Luke has done better with his test chances than Marmion. Meanwhile our pack was relatively quiet by their standards, with only captain Rory Best getting his name on the scoresheet among them, though as I suggested earlier it was the prolonged cameo from young Andrew Porter which was the highlight. The decision to swap him to tight head might go down as one of the more important ones in recent Irish rugby history if he keeps going the way he has been. Also once the numbers were crunched we were 8/8 in scrums, 15/15 in lineouts, a mere six tackles missed in total and just three penalties conceded so if that's not a good day at the office for the forwards I don't know what is. Of course we can't ignore the mini Italian fightback, one which very nearly earned them an unlikely try bonus point. The likes of Leavy, Larmour and Stockdale will all have defensive questions to answer at the DVD session on Monday, but I'd much rather let Joe handle those technicalities, especially when we had as many as six converted tries on the board before our guests had as much as one. But can I make one point about those three Italian tries...I really do think they should have seen yellow at some point and I very much doubt their score gets near 19 if that happens. It's like we had a homer ref in Paris and one sympathetic to an inferior away side in Dublin. Devin Toner had two knock ons in the space of a few minutes at the start of the second half...I point that out not because I wish to have a pop at him, rather than because overall errors were so few and far between that his were head and shoulders above most of the others [pun intended] although neither really cost us. After the injuries, the only other negative I can think of from this match is that the poor quality of opposition made it difficult to prepare for the Triple Crown contests that lie ahead for us, but that's hardly our fault. Now it's time to evaluate where this leaves us in the Championship. Two wins out of two and nine match points out of ten is exactly where we want to be. And I really don't know what to say to those who look at our displays against France and Italy and say 'Well you wouldn't want to do that against Wales or England' because the simple fact of the matter is that we'll be set up differently on those days. Elsewhere on the second weekend, England had some great individual performances yet overall were as vulnerable at Twickenham as I have seen them in a long while, Wales should be forgetting that 'try that should have been' and instead ask themselves why the couldn't get over the line with their other chances, while Scotland will be on a high after a slew of second half penalties seem to have eliminated the French.